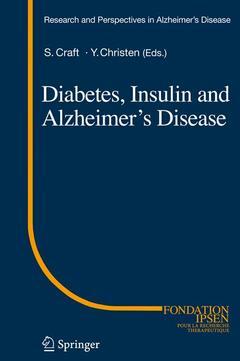 This volume brings together experts from basic and clinical science to provide a broad survey of the role of insulin in the brain, and to discuss the mechanisms through which insulin dysregulation contributes to the development of cognitive impairment and late-life neurodegenerative disease. Each author has greatly furthered our understanding of the relationships among insulin, diabetes, and Alzheimers disease, moving us far beyond the belief that the brain is an insulin-insensitive organ. Given the recent pandemic of conditions associated with insulin resistance, it is imperative that we achieve a comprehensive knowledge of the mechanisms through which insulin resistance affects brain function in order to develop therapeutic strategies to address these effects. Insulin Action in the Brain and the Pathogenesis of Alzheimers Disease by Carl Ronald Kahn and Ryo Suzuki.- The Brain-insulin Connection, Metabolic Diseases and Related Pathologies by Kyriaki Gerozissis.- Insulin Mediated Neuroplasticity in the Central Nervous System by Lawrence P. Reagan.- Stress Hormones and Neuroplasticity in the Diabetic Brain by Alexis M. Stranahan and Mark P. Mattson.- Diabetes and the Brain an Epidemiologic Perspective by Lenore J. Launer.- Cognition in Type 2 Diabetes: Brain Imaging Correlates and Vascular and Metabolic Risk Factors by Geert Jan Biessels.- The Relationship between the Continuum of Elevated Adiposity, Hyperinsulinemia, and Type 2 Diabetes and Late-onset Alzheimers disease: an Epidemiological Perspective byJosÃ© A. Luchsinger.- The Role of Insulin Dysregulation in Aging and Alzheimers disease by Suzanne Craft.- Is Alzheimers a Disorder of Ageing and why dont Mice get it? The Centrality of Insulin Signalling to Alzheimers disease Pathology by Simon Lovestone and Richard Killick.- PKC and Insulin Pathways in Memory Storage: Targets for Synaptogenesis, Anti-apoptosis, and the Treatment of AD by Miao-Kun Sun, Thomas J. Nelson and Daniel L. Alkon.- Diet, AÃ Oligomers and Defective Insulin and Neurotrophic Factor Signaling in Alzheimers disease by Greg M. Cole, Qiu-Lan Ma, Fusheng Yang, Atul Deshpande, Oliver Ubeda and Sally A. Frautschy.- Serum IGF-I, Life-style, and Risk of Alzheimers disease by Joaquin Piriz, Takeshi Nishijima, Jose Luis Trejo and Ignacio Torres Aleman.- Subject index.